A Reticulan in its native habitat. Reticulans are a predatory, space-faring species of the Alpha Octant. They were the first non-humanoid species that Humans made contact with. Together with Humans, Haephestians and the Pensee, the Reticulans were charter memebers of the United Stellar Commonwealth. Reticulans are notoriously fearless and curious. They have been known to leap chasms more than 50 times their own body-lengths without hesitation (40 body-lengths is considered a managable leap for a healthy Reticulan) in order to rescue friends and loved-ones or merely to sate their curiosity. 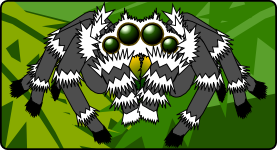 Reticulans are notable for developing an advanced tool-using culture without the benefit of graspers of any kind save their opposable pedipalps. Reticulans have 7-inch fangs suitable for injecting their powerful venom into their prey. Their venom is, interestingly enough, quite harmless to humans.